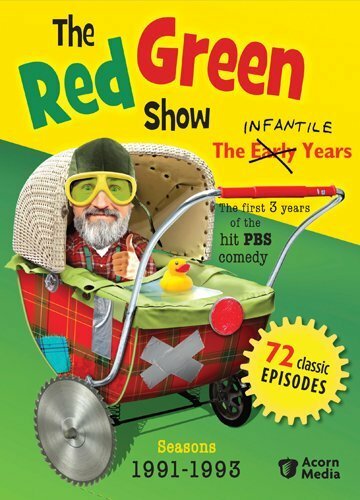 This latest Red Green Show DVD pack contains a total of 54 episodes from Seasons 10, 11, and 12 on nine DVDs and originally aired from 2000-2002. Season Nine left with Red’s (Steve Smith) assistant and nephew, Harold (Patrick McKenna), having left the possum lodge to head into the big city and make a new life for himself. While Red visited him a few times during that season, Harold is nowhere to be found in eason 10 as McKenna had actually moved away to California and did not plan to return to the show. This left a gaping hole -- or a great opportunity -- depending upon how you look at it in regards to the television program. Many shows fold when one of the main characters leave, but in this instance it caused the writers to be creative and gave an opportunity for some minor characters to step up and make a lasting impact. And in Season 10 there were four that rose to the challenge. Mike Hamar (Wayne Robson) - The local conman and thief who is out on parole and has the stickiest fingers you have ever seen. Winston Rothschild (Jeff Lumby) – Runs his own sewage and septic tank pumping company. His poetic commercials are regularly shown between segments. Dalton Humphrey (Bob Bainborough) – This thrift store owner is the cheapest person on the planet and would rip off his own mother. Ranger Gourd (Peter Keleghan) – The extremely lonely park ranger who has become a little insane in his solitary assignment and is way too attached to the local wildlife. While these four characters added a lot to the show, something was still missing. They were all Red’s friends and none of them could match wits or personalities with him. His character was just too overpowering and he was always the winner. Even though Harold was supposed to be a teenager, he was smarter than his uncle and when it came to trading verbal jabs he often one-upped the elder Green. So it was a welcome surprise when Harold returned at the beginning of Season 11. McKenna and Smith discussed the character of Harold before his return and decided that he needed to return to the show. But now he is a little older and a lot more experienced. Instead of being Red’s sidekick he came back as the Possum Lake PR Director. It was his job to bring tourists to the area and coordinate family-friendly events. Unfortunately for him and the denizens of Possum Lake his PR events always ended up taking a turn for the worse, such as his accidental renting of the lodge to a group of senior nudists, his idea for Christmas in July, and the formation of the Possum Lodge Mensa club. But even with the return of the nerdy and loveable nephew, it’s no longer up to the two Greens to carry the show. It’s now a well-rounded cast of characters participating in all of the familiar skits like “The Possum Lodge Word Game” and “The Handyman Corner”. Of course, Red’s still the focus of the show dispensing his words of wisdom, making unique items like a popcorn maker out of a clothes dryer, and all of it armed with the Handyman’s Secret Weapon. Duct Tape. Except for that one episode where the unthinkable happens and they run out. There are only a few special features included in the set. Steve Smith has a few production notes to read. A couple of comical character bios can be found on the DVDs, and a short introductory by Smith that mimics one of his previous production notes. After doing a few film reviews during an internship with the L.A. Times Todd learned how much he enjoyed it. He has written articles for the Daily Pilot, Blog Critics and is a former member of the Masked Movie Snobs. Another handful of episodes released in a never-ending Young Justice Season One. A solid delivery from the crew of Planet Express. Falls a little short trying to reach its loftier seasonal arc. More Red Green wackiness, thanks Todd !